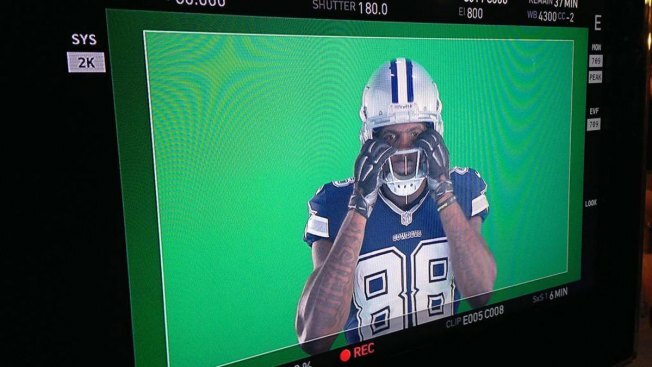 Dallas' Dez Bryant is ready for his close up in Sunday Night Football Prime Time. See, here’s the problem with Dez Bryant’s tough stance: His weak will power. Not that he doesn’t want to win or is one of the NFL’s hardest workers and most passionate players with a desire to win. But he loves the game too much to skip, well, even one game. Bryant has bellyached via social media this offseason about the Cowboys’ franchise tag and accompanying lack of long-term security, and he’s so far refused to sign the one-year contract that will pay him only $12.8 million in 2015. His agent has even hinted that the star receiver would be willing to miss the season opener to make his point. But those positions have officially been de-clawed. After showing up to the team’s final minicamp practice last week, Bryant voluntarily attended a promotional video shoot at NBC studios in Los Angeles. Bryant was there hyping, sure enough, the Cowboys’ first game against the Giants on Sunday Night Football. Hence his participation in the promos, Bryant obviously plans on playing in the game. Dez deserves a long-term contract. And, again, I understand his frustration. But we also know good and well that he loves football and the Cowboys too much to miss even one snap of one game over money.